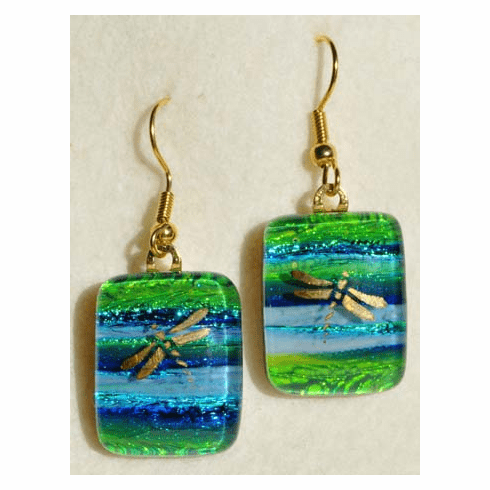 Golden Dragonflies Art Glass Pendant & Earrings - Handmade by American artist Suzzane Merkl, each piece of dichroic glass goes through multiple manipulations while firing and fusing. A very deep '3-D' like luminosity is the result, bringing motion to the art when sunlight shines on these jewels. The 1-1/2" square Pendant is hung from a 14k gold plate bale on an 18" black satin cord with a spring ring closure. The Earrings hang from 14k gold plate ear wires and measure 2/4" by 3/8". Each piece is unique, please allow for some variation. Gift Boxed.